In New York City and around the nation, there is intense interest in the question of what it takes to turn around a low-performing school. This study focused on two sets of initially low-performing NYC middle schools. The first group (the "turnaround schools") exhibited significant growth in academic performance between 2006 and 2010, while the other group saw minimal growth or remained stagnant during the same period. 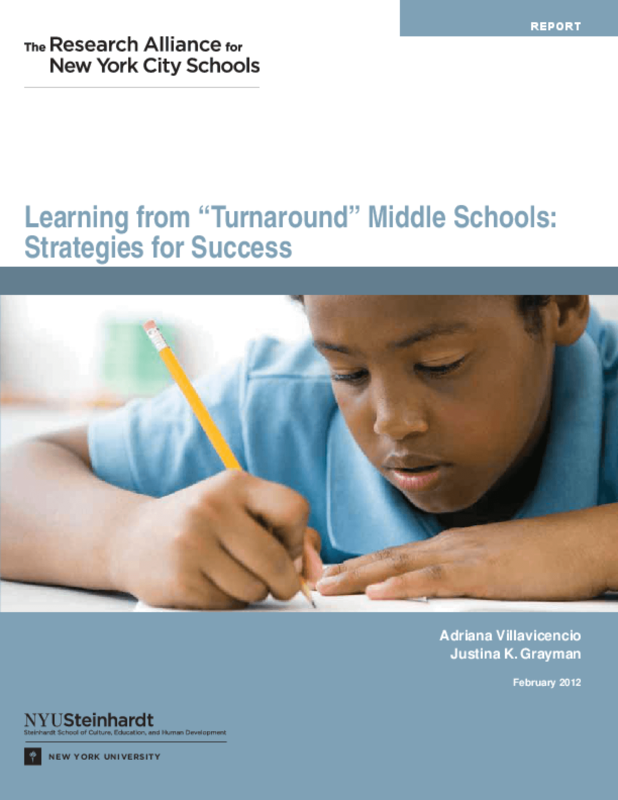 To gain an understanding of how the turnaround schools improved, researchers conducted in-depth interviews with principals and focus groups with teachers in both sets of schools. This report presents a rich picture of the conditions and strategies that enabled the turnaround schools to boost student achievement. Specifically, it identifies three interrelated "essential conditions" that were largely principal driven: aligning needs with goals, creating a positive work environment, and addressing student discipline and safety. These essential conditions, in turn, set the stage for implementing specific strategies to improve teaching and learning: developing teachers internally, creating small learning communities, targeting student sub-populations, and using data to inform instruction. The report also describes several ongoing challenges faced by all the schools. Finally, it draws on the study's findings to make recommendations for improving the effectiveness of middle schools here in New York City and around the country. The study is part of an ongoing focus on the middle grades for the Research Alliance. Copyright 2012 Research Alliance for New York City Schools, The.